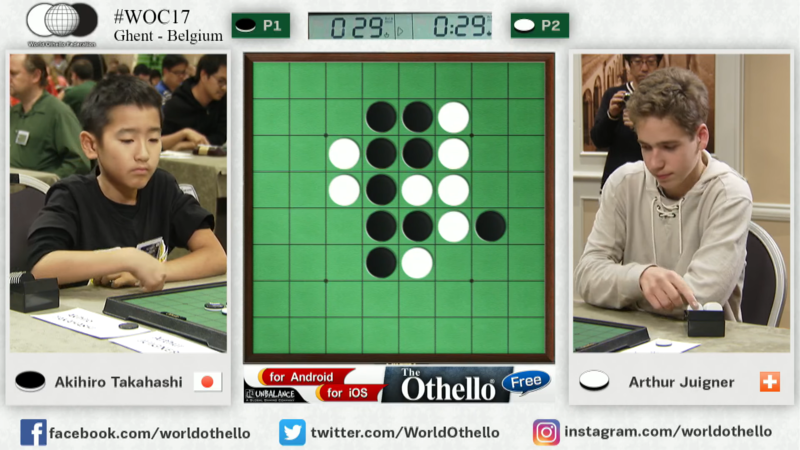 The World Othello Youth Championship started 2016, in Mito, Japan. When W.O.C. celebrated 40th years, it was decided that youth players should be invited. And the WOC Youth started. The first year, 2016, there were four youth players attending. In Ghent Belgium there were thirteen players attending. It is in the World Othello Federation Youth Committee plan to improve the Youth Championship. In Mito the first WOC for youth was held. There was a final between Arthur Juigner and Masaki Wada. Wada won the game with 36-28. They had already met in round 8 of the swiss tournament, there Juigner won with 36-28. Mikeal Lee got 5 point in the swiss part and ended third place. Alexandra Bryant won two games and ended fourth in the WOC Youth WOC. Alexandra Bryant qualified by answering a Othello quizz in a youth magazine in England. The British Othello tried new ways to find youth players. The response from the Othello world after the start of Youth WOC was amazing. Many federations started up youth qualifications and Othello events. Twelve federations sent youth players to Ghent in Belgium. And that was a success! The Japanese player, Takahashi, surprised a whole Othello world, when he qualified for the WOC 2018 semifinal, and also played the WOC 2018 final! In fact he won the swisspart of the WOC 2018. Therefore there was no final game between Takahasi and Micky Shifman, who got runner-up in WOC Youth 2018. There were many great moments in WOC 2018. The youth players had fun, and it was a great time for all players! Pic 3: The WOC 2018 price cermony.